Whether you want subtly or to stand out! Go to the next level of detail with your commitment. 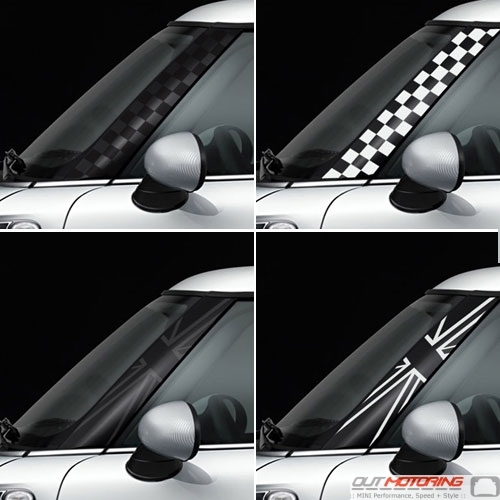 In Checkered Flag or Union Jack, these stick-on A-Pillar decals are easy to install and look great. Priced as a set/pair of left and right. 2. POSITION AND TEST THE GRAPHIC ON THE SURFACE DO NOT SEPARATE LINER FROM PRE-MASK This is to insure proper placement before the liner is removed. Lay the piece of left over liner over the graphic with shiny side of liner facing you. Proceed to apply hard pressure to squeegee out any remaining air bubbles.